Microsoft unveiled the next version of its operating system for mobile phones, Windows Phone 7 Series, featuring a move away from applications and towards functions. "It's all about the phone and how consumers react to the device," said Microsoft CEO Steve Ballmer, opening a news conference held outside the Mobile World Congress in Barcelona on Monday. To make the interface more personal, Microsoft is counting on a checkerboard of customizable "live tiles" that can update automatically with information from the phone or the Internet. Some of the tiles will update automatically to show frequent contacts or local information, while others can be customized manually. The tiles will be grouped into themed "hubs," for example a page of contacts called "people" or a page of photos called "pictures". There won't be too much personalization though: some aspects of every Windows Phone will be the same. Belfiore showed how the software will recognize addresses in incoming e-mails or calendar entries, converting them into hotlinks to Microsoft's Bing Maps property. The graphics Belfiore showed are spacious, using a thin typeface with big one-word titles for the themes of each screen -- day, local, music and so on. The text is displayed using a more precise version of Cleartype that Belfiore called sub-pixel positioning. The first version of Windows Phone 7 Series will not include Adobe Flash -- although Ballmer said he had "no objection" to Flash support. That marks the software apart from Apple's iPhone, which does not -- and will not -- support Flash. Developers will have to wait until Microsoft's Mix conference in Las Vegas next month to learn whether Windows Phone 7 Series will support Microsoft's Silverlight in place of the missing Flash, said Microsoft spokesman Casey McGee after the launch presentation. Microsoft plans to release a software development kit (SDK) to enable network operators and third parties to add new services and applications to the phones. AT&T, in the U.S., and Orange, in France, will be among the first operator partners to develop services specially for the phone. Although the new software emphasizes functions rather than applications, and Microsoft intends to keep tight control of the user interface, it will be possible to download third-party applications and games certified by Microsoft through a "marketplace" hub. "There will be opportunities for partners to add value and build in functionality," said McGee. Developers will have to wait to learn whether the applications they created for the previous version of Microsoft's mobile operating system, Windows Mobile 6.5, can be ported to the new platform, McGee said. Microsoft's own mobile software developers are focusing very much on the new platform. 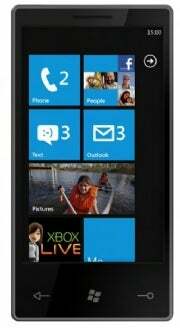 "Windows Phone 7 Series is the priority for Microsoft's communications business," McGee said. Nevertheless, he said, the company will continue to deliver support for Windows Mobile 6.5 for three to five years from its October 2009 launch. He expects vendors to continue to launch devices based on Windows Mobile 6.5 for some time to come.